Manitoba’s rough winter isn’t likely to be followed by a spring flood, although flood officials are keeping an eye on a storm heading this way on Saturday. 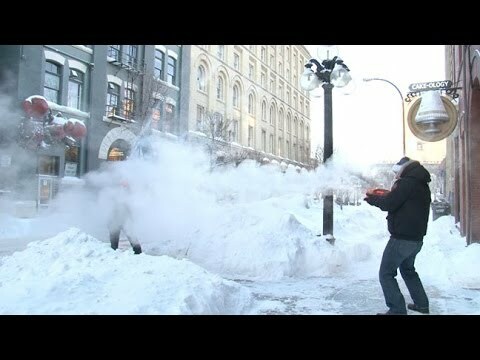 Well, it’s official: Winnipeg had the coldest winter in Canada … if not on planet Earth … if not on Mars too. Other than the “car angel” above, here’s the proof – that’s gone viral. Winnipeg’s coldest winter since 1898 is cutting into just about everybody’s bottom line, with electricity bills up by an average of about 13 per cent, according to Manitoba Hydro. Sorry, Winnipeg. You’re just going to have to find something else to complain about. No Winnipegger alive has ever experienced the kind of winter we’ve just survived. Organizers of the 107th Royal Manitoba Winter Fair in Brandon, Man., are expecting to see more than 100,000 people at the Keystone Centre for this week’s agricultural exhibition. As the Canadian music scene descends upon Winnipeg for the Junos, so does a westerly wind which will briefly warm up the city on Saturday, but leave before the big event on Sunday. Who had the worst winter in Canada? … nicely to welcome guests,” said Kenny Boyce, events manager with the City of Winnipeg. Dirty piles of snow, ice and litter can currently be seen on city streets in the downtown. Some Manitobans who spoke to CTV News Monday said the cleanup is needed.